This summer, my husband and I will celebrate our 10th wedding anniversary. Although we weren’t young by any means when we married (27 and 28), we were fairly naïve on what would come down the road in the “then comes Carrie with a baby carriage” department. Our angelic daughter was born two weeks after our first anniversary, and the whole world changed. Her two brothers arrived a few years later, and now we celebrate ten years, three children, two different states, moving a few times, a dog and cat, and a whole lot of the unexpected. When we embarked upon parenthood, we had no clue what we were doing. Now that I’m a seasoned pro (haha! 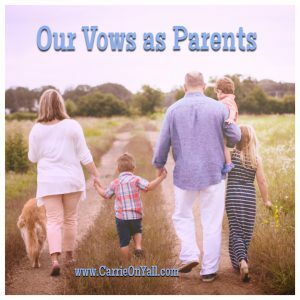 There’s no such thing…), there are a few vows I wish I would have taken with my husband when the doctor handed our little babies to us. I, ________(parent)_______, and I, ________(parent)_______ , take ________(child)_______ from this day forward. Whether the doctor just handed us a baby (or two or more), or we adopted or fostered, we promise to love this child always. No matter what our family unit looks like, we are in this, and this child is going to depend on us. We accept this responsibility and will do our best. We take this child, to have and to hold, and we’ll do a lot of having and holding. We will have more chaos than we know what to do with. We will have meals at odd hours that consist of leftover kid food. We will have toys and messes of indeterminate origin all over our house, and we’ll have a hard time remembering where we put the car keys and who needs to be dropped off when and where. We will hold babies, hold their hands as they cross the street, hold the diaper bag, hold them when they’ve had nightmares, and we’ll most likely hold actual vomit in our hands at some point. But we also know that, as they grow older, we’ll miss the having and holding. We take this child, for better or worse. As parents, we will enjoy the better and endure the worse. We will teach our child right from wrong, and we’ll discipline this child when he/she deserves it. The better is so good, even when it doesn’t happen during the important times we expect (like expensive vacations and dinners out in restaurants). We realize that the better will sneak up on us and steal our hearts in ways we didn’t see coming. The better is a teenager who comes in for a hug and says we aren’t so embarrassing after all. The better is a child asking for an afternoon story while we’re cuddled on the couch. And the worse? Frankly, the worse is scary. We fear that our bad parenting moments will haunt our kids forever. We hope they won’t remember the times we failed them, or lost our temper, or forgot the thing, or grounded them from everything until they were thirty. The worse is also the outside world where it’s harder to protect our precious children. We can’t and shouldn’t shelter them from everyday failure and disappointment, but we will fight the real-life boogeymen to the death. Mess with our kid, and you get us. We take this child, for richer or poorer. It’s a funny thing. Parents will always and never have enough. We will always want to buy our kids the cute outfit or take them to the fun place that costs extra. But most often, our kids just want us. No matter our socioeconomic background, kids make us richer in experience, even as we’re buying endless diapers and saving drops in the bucket for their college tuition down the road. We take this child, in sickness and in health. If this child is healthy, we won’t take that for granted. If this child is temporarily sick, we will nurse her/him back to health, catch vomit or snot in our bare hands, and spray liberal amounts of Lysol on every available surface. If this child has a life-threatening illness or permanent condition or special needs, we will love and support our child and be his fiercest advocate and her most loving support system. When we said we’d love you always, we meant it. Until death do us part. Nothing can really prepare us for parenthood. Not parenting books, or babysitting other people’s kids, or adopting a puppy. Author Elizabeth Stone once said, “Making the decision to have a child – it is momentous. It is to decide forever to have your heart go walking around outside your body.” As we have been entrusted with this child, we promise that we’ll never be the same again, that we are better because of this child, and hopefully, this child will be better because we were his/her parents. Thanks for reading, y’all! You can also follow me on Facebook, Twitter, or Instagram.